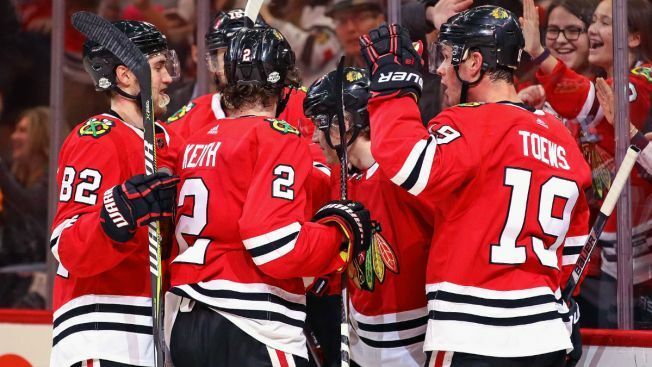 The Chicago Blackhawks and Jonathan Toews executed their plan — and didn't waste any time in overtime. The Blackhawks' signature puck possession game has disappeared for much of their disappointing season. But in overtime, Chicago was the only team to touch the puck on a play Toews said came almost off the drawing board. "It was nice to get that chance right away and bury it," Toews said. "Overtime can go either way, and it's usually one great scoring chance to the next." "That was a pretty good play," coach Joel Quenneville said. "A great pass and a great shot. Good ending there." Chicago's Jean-Francois Berube stopped 33 shots and Erik Gustafsson connected in the first as the fading Blackhawks won for the second time in five games. Berube was sharp in his fourth game since being called up from Rockford of the AHL. The Blackhawks have been without injured No. 1 goalie Corey Crawford since Dec. 23. "Every time you go in the net you try to showcase yourself," Berube said. "For me, it's 'Take it one game at a time and play the game I can play and let the result unfold.'" Colorado's Nathan MacKinnon extended his points streak to six games with his team-leading 32nd goal in the second period. MacKinnon has seven goals and six assists during the run and eight goals and nine assists in his last eight games. Varlamov stopped 25 shots as the Avalanche lost their second straight in overtime, but earned a point to pull even with the idle Los Angeles Kings, who are in the second Western Conference wild-card spot. Coach Jared Bednar was disappointed his team didn't buckle down in overtime for a chance to leapfrog Los Angeles. "Wish we had two (points)," Bednar said. "I didn't think we played a complete game tonight. "And then, not happy with the overtime goal at all. We made a mistake on that easy coverage and we let a guy get in behind us, and it cost us the second point." The Avalanche lost 4-3 at home to Nashville on Sunday. Gustafsson was credited with opening the scoring 5:08 into the game. The defenseman whipped a crisp pass from the top of the left circle toward Kane at the right side of the crease. Kane was covered by Colorado's Patrik Nemeth, but the puck deflected off Nemeth's left skate and into the net. MacKinnon's power-play goal with 3:42 left in the second tied it. After taking a cross-ice feed from Tyson Barrie, MacKinnon fired in a high shot from the left circle, beating Berube on the stick side as the goalie slid across the crease. An apparent goal by Chicago's Brandon Saad with 1:17 left in the period was disallowed after a video review determined Saad kicked the puck into the net with his right skate. Capping a spinning move, Kane fed the puck across the crease to Saad on the left side of the net. The puck struck Saad and a replay showed him sweeping it just over the goal line. Varlamov stopped Chicago rookie Alex DeBrincat on a point-blank deflection two minutes into the scoreless third. He made a close-in glove save on Toews minutes later. Colorado's J.T. Compher fired a rebound wide of a partly open net with 5:40 left in regulation. Each team failed to convert a power play late in the third.